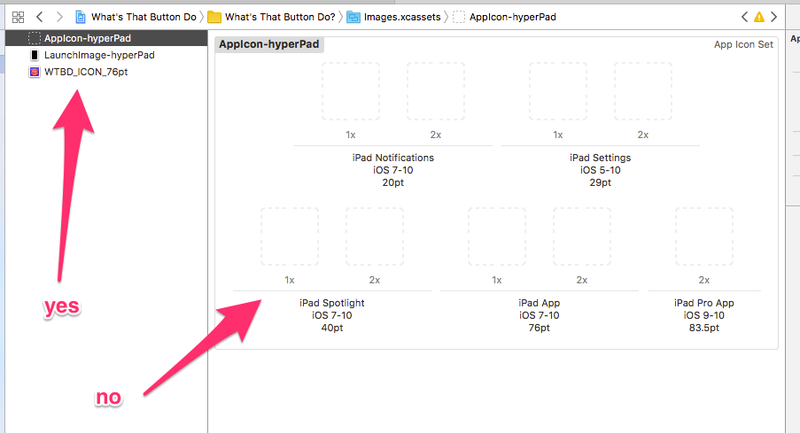 From HyperPad to AppStore upload? I'm closing in on finishing my app. I'm wondering if anyone has a tutorial on going through the process of what I need to do after I push publish in HP? We have a tutorial on that! But it needs to be updated so that you open the .xcworkspace file instead of the .xcodeproj file. I'm trying to follow this tutorial and having a number of issues. First is icon related. I'm trying to drag my icons in as the tutorial says, but I don't seem to be able to do it correctly. I can drag an icon into the left column and create a new icon set, but can't drag the icon into the existing set. Any help? You don't drag the image into the left column. Drag from Finder into the dotted squares. @Hamed Thanks for the quick response! I've been trying to drag from the finder to the dotted squares, but Xcode doesn't allow. The only place it will let me drop the icon is in the left column. Any ideas? I'm in Xcode 8. Thanks! @Hamed Discovered the problem. I was trying to use JPG, instead of PNG. All good now.